“You have been on a long, uphill journey, and your energy is almost spent. Though you have faltered at times, you have not let go of My hand. I am pleased with your desire to stay close to Me. There is one thing, however, that displeases Me: your tendency to complain. You may talk to Me as much as you like about the difficulty of the path we are following. I understand better than anyone else the stresses and strains that have afflicted you. You can ventilate safely to Me, because talking with Me tempers your thoughts and helps you see things from My perspective. Thank you Lord for this message today. It has been a very long and tiring battle and yes, I am just so tried. Yes, I have been so angry for a few months now. I can try to justify my awful behavior all day long, but truly I don’t have a single good reason for my mouth. How is it that I can praise Your name one minute and go into a total meltdown the next? That makes no sense. There is something wrong… My pride has gotten in the way and I am trying to do this life on my own. But I was never meant to do that. When I gave my life to you, I gave all of it. I guess I have forgotten that. 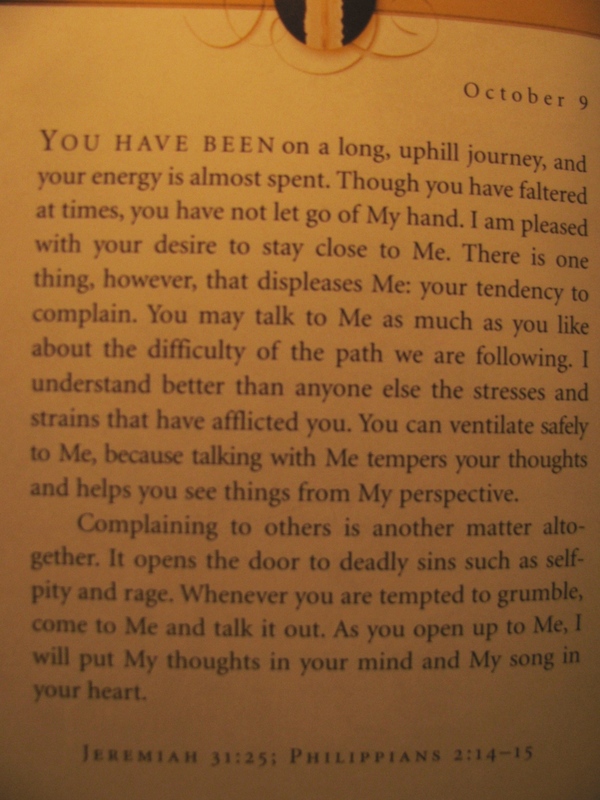 Father, thank you for this reminder today; fill me with patience for those times where I want to vent. Lord , bind my mouth if anything mean or angry or hurtful or nasty is about to come out. Father… forgive me and keep me humble.